A huge German Shepherd tearing away at a whole chicken looks so natural, like a wolf devouring their prey. 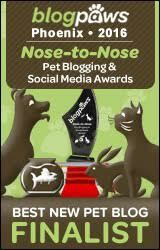 But you might have a harder time picturing your sub-10 pound dog enjoying a natural diet of their own. If your Chihuahua lived in the wild, they wouldn’t be able to take down a deer unless they were in a pack of 100 tiny dogs, biting its ankles over hundreds of miles until it was weak enough for them to take down. Seriously, a raw diet is better than what a small canine would eat in the wild. When raw feeding your Chihuahua, keep in mind that it’s not really about reverting back to the wilderness – it’s about moving forward, supplying fresh, complete meals that are suitable for a creature that is, though tiny, 98% (give or take a few tenths of a percentage, depending on who you ask) genetically identical to a wolf. Chihuahuas are one of the longest-living dog breeds, and could live over 20 years. Commercial food can take a substantial toll on your little dog’s health in two decades. Our little dogs are notoriously prone to dental problems because of their crowded teeth, exacerbated by the high starch content in commercial foods that turns into sugars that feed bacteria – which not only wears at their teeth, but puts a strain on their digestive and circulatory systems. Obesity, diabetes and cancer are all deadly epidemics that are killing more and more dogs each year. There are no singular, solid reasons why this is happening, but cutting down on unnecessary carbs and feeding fresh foods can help keep your dog from becoming another victim of a totally preventable illness. If you can’t feed a full raw diet, even a few raw meals per week, or raw snacks, can boost your dog’s health. With such a tiny dog, though, you may be able to easy afford the cost of raw food, and won’t have to sacrifice much freezer space, either. In some cases, you might need to offer a cooked diet, rather than raw. If your Chihuahua has any known health issues, particularly those that pertain to their immune system, or diabetes, or kidney disease… work with a holistic vet to find out how you can boost your dog’s health through the right diet. That said, some dogs take a new raw diet very easily. 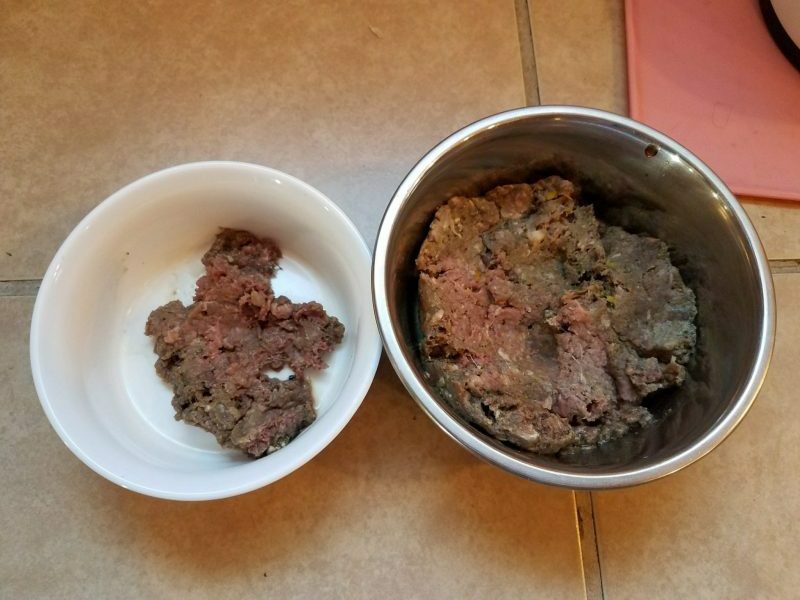 Matilda and Cow went straight from kibble to raw with no digestive upset, and in a few weeks Cow’s red, itchy belly had cleared up and Matilda’s tartar started to disappear. 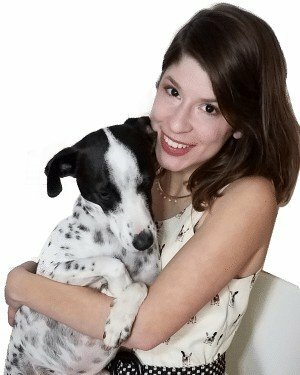 Within a few months, Cow had significantly more energy, and both dogs had lost a little weight, and their coats are softer and shinier. Other dogs may not be able to tolerate a sudden change in diet, and others need digestive supplements to avoid vomiting and diarrhea while they adjust. So, proceed with caution and common sense, and perhaps the guidance of a vet who is knowledgable about fresh diets. How Much Should My Chihuahua Eat? Generally, a dog should eat 2-3% of their ideal weight in raw food PER DAY. Matilda weighs 4 pounds and 6 ounces, and I think her weight is perfect, and she could even stand to gain a few ounces. 4 LB 6 OZ is 70 ounces. 3% of 70 is 2.1, so Matilda needs to eat about 2 ounces per day, or an ounce per meal, as she has two meals each day. I’m personally not much of a perfectionist, so I don’t measure out an ounce for every meal, I’ve just found that an ounce is two heaping tablespoons of food. She also gets plenty of fruit and veggie snacks plus training treats. If she had a weight issue, I’d be more precise, but this has been working for us just fine. You can always adjust serving sizes to suit your dog’s body condition and activity level. Went on a long hike? Feed more that day! Cooped up in bad weather? Cut back a little. Raw meaty bones – completely edible bones with plenty of meat left on them, only a few raw meaty bones are appropriate for small dogs. 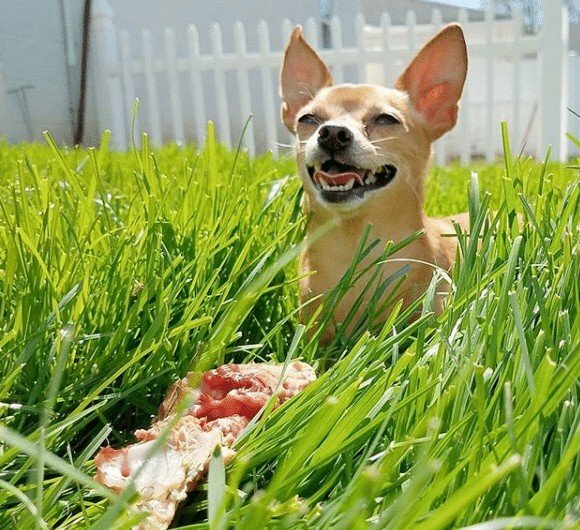 Recreational bones – larger bones that are too big for your Chihuahua to eat, they’re meant for your dog to work on for entertainment and to clean their teeth. 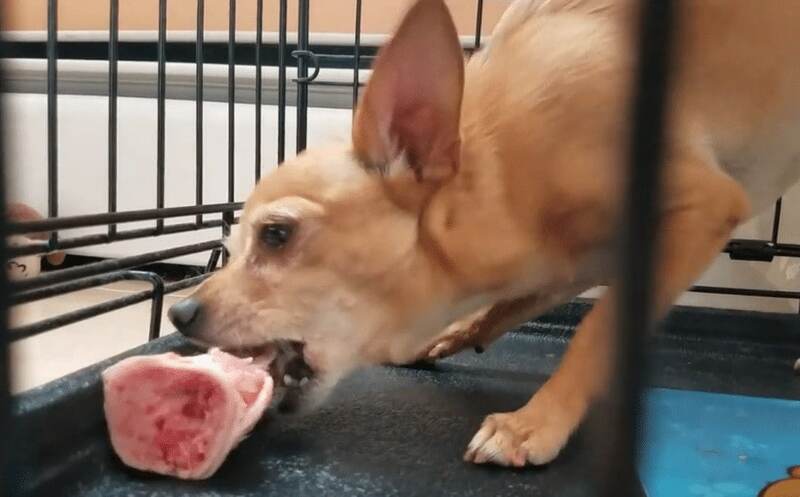 It’s tough to find raw meaty bones that are lightweight and easy for a Chihuahua to completely consume. Also, if your Chihuahua only needs a few ounces of bone, it’s difficult to find a cut of meat that fits their serving size. I cut quail into 1/4 chunks, which makes a perfect meal for Matilda. I can also cut toes off a duck’s foot for her. Even Chihuahuas may try to swallow bones whole and could choke, so you have to supervise them, and may need to serve frozen bones to teach them to chew carefully. You could also serve bones that are larger than their head, and if it’s too big for one meal, you’ll have to take it away before they’ve eaten all of it. Recreational bones for Chihuahuas are easy because almost every other type of bone is large enough for them to work on for hours of fun. In my experience, raw dog food costs about $3 per pound on average whether I make it myself or get it from a local supplier, typically a butcher that grinds up fresh meat. I’d really suggest feeding a commercial raw diet that meets AAFCO standards so you know your Chihuahua is getting all of the vitamins and nutrients they need. Not every raw food is complete and balanced – make sure you know what you’re getting. You might decide to add in supplements, or nutrient-dense foods like eggs, canned fish or dark green veggies. You can buy quail eggs or mix a single egg into multiple meals – a single egg would be more than a meal for Matilda. Right now, Matilda eats beef and pork grinds from a butcher that includes organ, bone and green tripe, but no veggies. When she’s not eating that, she’s eating a recipe I made with supermarket ground turkey, veggies, eggs, organ meat, canned fish and veggies, all blended together, with whole bones for some meals to keep her teeth clean. If you’re going to create your own cooked or raw food recipe, it’s imperative that you do your own research – I’ve yet to publish everything I’ve learned about raw feeding on Little Dog Tips, and even when I do, we’re always learning more! Your dog can become very sick from incomplete diets. If you’re not 100% sure that you know what you’re doing, just keep buying their food until you’re confident enough to make it yourself. 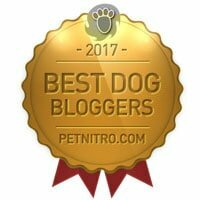 I’d love to see your Chihuahuas and small dogs eating their fresh meals! Post on our Facebook Page or tag @Matildawoofwoof on Instagram.